Birhan's Facebook page shows a picture of a handsome, self-assured young man, smiling confidently at the camera. His sporadic posts — mainly religious quotes — offer no mention of his current location; no hint that he is sleeping rough in Calais, France. Standing in a field near the Channel Tunnel entrance he looks gaunter than he did when the photos were taken. Twitchy and nervous, his brown hood pulled up, he tells VICE News his story quickly. The 27-year-old has spent the last 15 days sleeping under trees close to the train tracks. For the first seven of those days his companions included a Sudanese man, with whom he said he built an easy rapport. That man died earlier this month —hit by a truck while attempting to sneak on board a vehicle traveling to the UK. "All the people, they want to try," Birhan said. "No one cares about themselves, they just want to enter the train, they want to get any way to Britain. No one cares about their own life so we are losing our friends, our brothers, maybe we lose our life." Birhan's wife has already been in England for a year. He only earned around $30 per month doing military service in his homeland of Eritrea, so she moved to Saudi Arabia to earn money as a domestic worker. "They beat her," he explained. "They did bad things to her." When the family she worked for took her with them to France, she escaped, traveling through Calais to England. Birhan then sold up all the couple's possessions, including his wife's gold, in order to follow her. He paid $3,000 for the journey from Sudan to Italy, and $2,000 from Italy to Calais. During the trip, he wound up in Libya for three months. "In Libya if they see you in the street they will take you and put you in jail," he recalled. "If they want they will also kill you. No one will ask about you. Libya is so difficult for us, the immigrants." After a day afloat in the Mediterranean, he says he was rescued by a Spanish boat and taken to Italy. From there he made his way to France. "I want to improve my knowledge. I want to learn. I want to be educated," Birhan said. "I want to learn about my country also. Because no one knows what is happening in Eritrea, no one will answer me. Because no journalists are able to enter to enter. So I want the world to know about my country. To find a solution for my country." Birhan's uncle was recently imprisoned for speaking out about his religious views, and Birhan doesn't know where he is being held or even if he is still alive. "I have no words to explain [Eritrea]. I can't explain it because it's dark. It's dark," he repeated. "If I say or if I do anything they will kill my father or my mother. So I still am afraid and I just have to take care. "To live or die — it becomes the same for us. If I die it's the same. Because our life is so difficult. If you die, if you're alive, it becomes the same for us." As darkness falls Birhan's companions ready themselves, before heading off in small groups towards the train tracks. "Maybe tonight's the night," one of them jokes as they leave. The following day — Tuesday — they're all back in the same spot, recounting the events of the last 24 hours. The cloying fumes from gas fired by police emanate from their clothes, strong enough to make me sneeze. Birhan's friend Altaib has a scratch on his cheek. Birhan said they couldn't even reach the train station because of the high level of security around it. The two men were discovered by police at 5am and thrown in a van with another group of migrants before being driven an hour away. "They sprayed gas in our eyes," Birhan said, wincing. Together, they walked back towards the train tracks in the early hours of the morning, asking directions on the way, before stopping to rest in the trees. Now regrouped, at 5pm they've just received their only meal of the day, gifted by a local activist group. The men sit in a circle on the grass, sharing bread and meat from polystyrene cartons, also offering me some. According to the UN refugee agency, UNHCR, 60 million people around the world are currently displaced — the equivalent of one in every 122 people. Though Calais has been heavily covered in the news recently, almost the same amount of migrants that make it to Calais each year are arriving on the shores of Greece and Italy every week, so the so-called "crisis" in France is really only symptomatic of a much bigger problem. Less than 2 percent of those who arrive in Europe end up in Calais. Since January, more than 185,000 migrants have crossed the Mediterranean, coming from war-torn countries in the Middle East and Africa, as well as impoverished parts of sub-Saharan Africa and Asia. Those who aim to make it to England are just a small minority, and are often motivated by language capabilities or the desire to be reunited with family members, though others say they've heard that immigrants and asylum seekers are treated much better in the UK than in many other countries. The port city of Calais is the main destination for those trying to make the crossing, and the influx and resulting bottleneck has led to congestion and delays on both sides of the Channel, as well as reported millions of dollars worth of losses in revenue for the haulage industry. It has also provoked strong and panicked reactions from the British government, with UK Prime Minister David Cameron branding the Calais migrants a "swarm" and Foreign Secretary Philip Hammond saying on Sunday that those migrants "marauding" in the Calais area are threatening Europe's "standard of living." The British government, blaming France, said they would send 100 extra security guards and sniffer dogs to help keep the migrants from crossing. The French politicians have blamed Britain, saying the border should begin in the UK rather than on French shores. No definite statistics exist on how many of those who arrive in Calais are making it through to England, though French authorities estimate that 70 percent of those who arrive in the French port leave the vicinity within a four-month period. British police say the only figures they have are for the number of illegal migrants caught in Kent, the UK county that the Channel Tunnel links to. This figure came to 400 in a five-week period from the start of June. European Union laws, in particular the Dublin Regulation, mean that a refugee must claim asylum in the first European country they arrive in. While some of those in Calais have successfully avoided being registered thus far, others have already been fingerprinted, making it likely that they will be sent back even if they do make it to the UK. Richard Burnett, chief executive of the Road Haulage Association, met VICE News as he visited the "Jungle" migrant camp in Calais last week, where he said truck drivers had reported being threatened by migrants, and some even had guns pulled on them. "Some of the stories we've heard from the people who we've spoken to this morning in terms of how far they've traveled, how they've got here, and their journeys, it's a horrendous situation," he said, removing his sunglasses to survey the scene around him. "But I think from my perspective there's another side to this, there's a human element to the British truck drivers that have to face some of the threats. That's a different sort of threat." Christian Salome, president of NGO L'Auberge des Migrants, was also in the camp. He told VICE News that contrary to the media reports he doesn't think the situation in Calais is getting worse — there's just more coverage now. Over the six years his organization has been working there, he said nobody was coming to the camps or speaking out about the problems there. "So for us it is a little bit better." "We have always had between 2,000 and 3,000 people here coming from countries where there is a conflict. In 2009 it was more people coming from Afghanistan, Pakistan, now it's more people coming from Sudan, from Syria, from Eritrea, but the situation is exactly the same." Salome continued: "I hope the problem will be taken in charge by political men and women and it will be solved because in fact the problem here is quite simple. They are mainly war refugees, they have good reason to go to the UK, they have family there, they speak English." In Calais, the concept of "England" is ubiquitous. Migrants joke that they will rename their row of tents "Queen Elizabeth Street," and have labeled an area of the Jungle "New London." A Sudanese man proudly wore a t-shirt printed with the city's name, while an Eritrean woman's blanket was covered in Union Jack flags. These reminders are not just confined to the camps. Closer to the ferry port, a sweatshirt emblazoned with "England" hung from a barbed wire fence. Meanwhile, in the London Bridge pub on Place d'Armes in central Calais, Christophe Auchede — serving behind the bar — said he's not happy about the current situation. "It is a great human misery," he wrote into his phone's Google Translate app, before showing it to VICE News. Martin and Sally, a middle-aged couple on vacation from London, strolled through the square outside. They told VICE News they had only seen a few migrants in parks around the town, mainly in parks. "I think there's a case for letting them in," Martin said. "They're young, resourceful people who want to make a better life for themselves. The kind of people we want in England." "The situation is abhorrent," Sally added. Early evening in Calais sees the beginning of a game of cat and mouse that carries on throughout the night. Migrants and journalists gather on high to watch police flashlights crisscrossing down below near the entrance to the tunnel. More migrants hide in the grasses, inching ever closer to the fences, rolling through the fields or burrowing under barriers, aiding each other on the way. Those who come down to the entrance from the main Jungle camp walk for almost two hours to get there, leaving behind their makeshift homes and meager possessions. Some reported that locals would throw rocks at them as they plodded along. From dusk, there's a fire in the trees by a lake where some migrants assemble to chat, smoke, or pray before heading out. Idris, 30, wore a checkered scarf. "If I stay in France or Germany or other countries it is hard to learn their language," he said. His sister is in England. "We are refugees, not prisoners," he added. He has no plans to go back home. "I will go back to Eritrea when there is no longer a dictatorship," he said. Nearby is Salem, a 24-year-old from Damascus, Syria. One his favorite books is Heart of Darkness, he told VICE News, but he said he never understood it like he does now, after his journey through Europe. The son of a former Syrian civil servant. Salem traveled with his brother with funds borrowed from their family. "The first try I didn't have any money but my brother has a big mouth. I don't ask my family for money, I try to go alone, but he came and he came with money," he said. They went from Turkey, to Greece, through Europe and eventually reached the Netherlands, where his brother stayed. "I didn't want to stay there. I booked a ticket to Calais and here I am." Migrants in Calais are loathe to have their photo taken — partly because they are worried that it will be used in some way against them during their asylum applications, but also because they don't want their families back home to realize the conditions they're currently living in. Salem told VICE News that, while speaking to his relatives in Syria, he occasionally lies, though today he felt compelled to send them a picture of his food. Salem wants to study English literature. Before he left Syria he says he was studying for a masters degree. He read Crime and Punishment twice in a month, and is a fan of The Scarlet Letter. "Anywhere in Syria there is no PHD, you have to go to either America or England," he said. When he arrived in Calais, Salem was wearing only a T-shirt and jeans, and had to ask an NGO for a jacket. He said the humanitarian worker initially thought he was a journalist, "because I'm clean." In four days he had tried to get to England twice. He wasn't feeling optimistic about his chances, though word had spread among the Syrians that one of their countryfolk was successful in getting to England on Monday. "We know because he didn't come back," Salem said. Sometimes migrants don't come back for another reason. Last Wednesday a funeral was held for an Eritrean 17-year-old named Houmed Moussa who reportedly drowned on July 19 while trying to make the crossing. The dead teenager had been with another man when he died. The two were hiding from the French police at night when they fell down a deep hole, hidden by the long grass. One was saved, but for Moussa it was too late. Speaking after the burial, Elmus, an Eritrean who has been living legally in Paris for the last 20 years, said that what's missing in the coverage of the crisis is any suggestion of humanity. "They're not coming to get riches, they just want to survive, but nobody cares," he said. Adam Hussain, another Eritrean and activist, has been in France for 24 years. He came down from Paris with Elmus for the funeral. 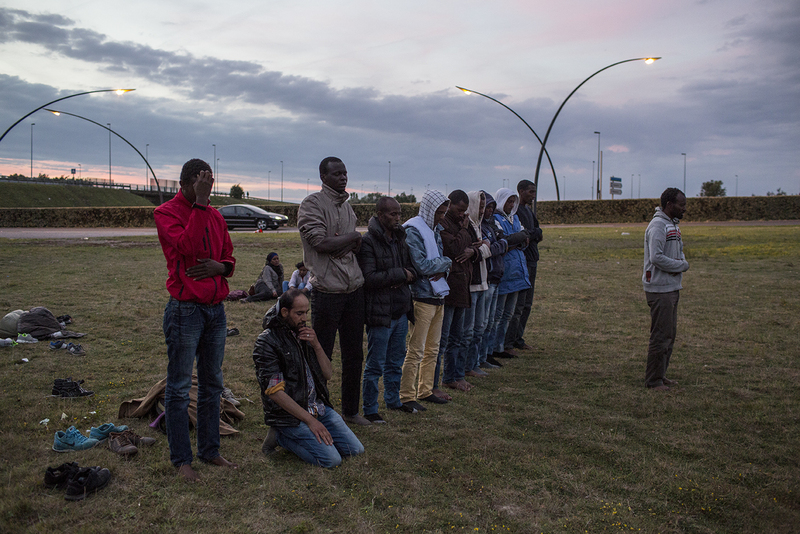 No family had come to Europe with the 17-year-old, so some of Calais' Eritrean migrants banded together with a local Islamic group to pay for the service. Hussain said that he thinks tragedies like this will continue to happen again and again. "Everybody knows the question, everybody knows the answer," he said. "Nobody wants to take responsibility. Everybody wants to [abandon] these people. The French police, they want to leave these people, and the UK [too]." At least 10 migrants are believed to have died since the beginning of June. In the Jungle camp, an Eritrean man claimed five of his friends had made it to the UK in the past two weeks. "I love London because I love Arsenal," he said. Earlier he told another journalist that his favorite team was Manchester. Standing on a hill beside a busy roadside, an Eritrean woman with an 8-year-old girl said sadly: "Even if I only go for one day and then they deport me, England is England." By the lake a Syrian boy — keen to talk — explained that he wants to study English literature, before another man, watching him closely, told him to stop talking. "I'll get in trouble if I keep speaking to you," he concluded. Another man who said he had a wife in Manchester said he's tried to reach her 16 or 17 times now, and that four Syrians were successful on Monday night. Aarif, an Afghan, sat smoking, surrounded by dozens more. One woman was with the group, but she sat apart, wearing a green headscarf and clutching a sleeping bag. She told VICE News she found it very cold at night. "I'm going to go inside the train, try my luck today," she said. "Do you feel lucky?" VICE News asked. "Not really, but I'll have to try." Here for 25 days, Aarif said he couldn't count the amount of times he has tried to cross. " Every day, sometimes every day twice." "I'm stopped all the time, we've been stopped many times," he continued. "But everyone will make it one day, you know. Yes, I think so. Whatever David Cameron does, we're all going to go, you know. "He will spend money here making walls and all these stupid things, but end of story, everyone will go. He will lose money for nothing, you know what I mean. We will find a way. Whatever they do, I'm telling you, we will go one day. Everyone will go." Driving through passport control we spotted two detained migrants sitting quietly beside security staff. We jumped after seeing two people running from the bushes towards a car, only to realize that they were tourists who had been using the bathroom. In the Charles Dickens Terminal parking lot before the tunnel begins, we spoke to a British man, just back from vacation in Euro Disney, who told us he hadn't slept the night before out of fear of the chaos. Another mother asked how desperate people must be to make such sacrifices, as her daughter ran in circles around the family's car. On Sunday night, after four days back in London, my phone buzzed. It was a message from Birhan, the 27-year-old Eritrean. It read: "I am in Britain. I'm so happy."